Professional-grade SD and HD (Quad-A/V) MPEG2 and MPEG4 encoder, ASI Multiplexer, and SPTS/MPTS IPTV Streamer. CVBS, YPbPr or HDMI are user selectable for each of 4 inputs. Audio/video 4 x SELECTABLE INPUTS. HDMI, YPbpr, or CVBS + Closed Caption input for CVBS. 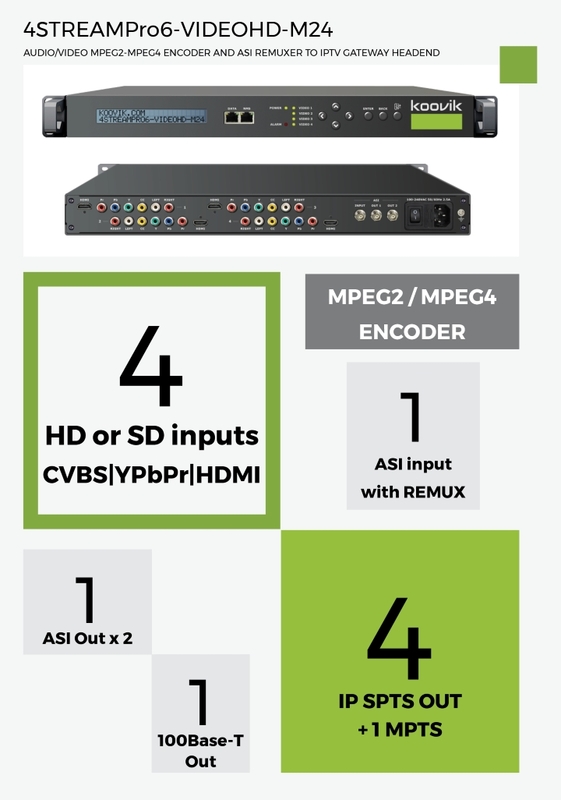 VIDEO CODECS MPEG4 AVC H.264. High and Main profile. MPEG2. BIT-RATE 0.8 Mbps to 19 Mbps. CBR or VBR (*two delay modes for VBR). User selectable per each video input. included 1 x mains cable, 1 x ground cable, 4 x HDMI to HDMI cable, 4 x RCA to RCA A/V cables, 1 x BNC male to BNC male.